In this day and age, it’s imperative to never underestimate the importance of an online presence for your small business. Gone are the days of phone book listings and directories and in their place are Google search results and optimised map listings. Taking advantage by claiming your listing, now more than ever, can mean the difference between success and failure when competing against other local businesses and there are a few key ways that this comes into play. 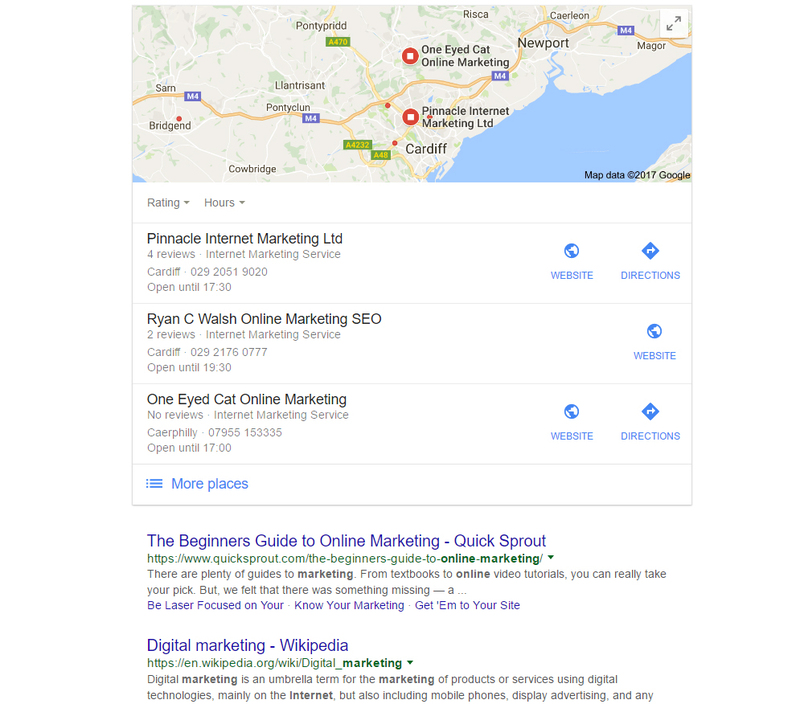 The example below is for seo cardiff as the search term which brings up the map below. Once you register your business with Google’s My Business portal, your business is officially added to the Google network. This includes Google Search, Google Maps and Google+. With Google topping the list of the world’s most popular search engine, having your business information on their network means you’ll be front and centre when potential customers are performing a search or even using Google’s own social network. Your business will also appear in Google Maps—a valuable alternative to written directions or word of mouth. For potential customers, when searching for a business, having access to the correct and up-to-date information can mean the difference between them using your services or not. With so many competitive small business markets, it’s often easy to find another alternative if one business isn’t easily accessible online. This means current business hours of operation and location. Thankfully, with a Google Map listing, this information will appear when potential customers search a generalised term that relates to your business. It also means you’ll have control of the information that is put online, rather than anonymous users trying to piece it together themselves. In the same way that having your business accessible to potential customers online can draw in new clientele, it can also foster and build current customer relationships. Appearing on the Google network not only means you’ll appear in Google Maps, but you’ll also have access to other useful Google tools, like Google+. Small businesses can interact on Google’s social media network to keep customers updated on day-to-day changes and even field questions if they choose. Followers of your business can then like and share your business with their family and friends, ultimately creating more awareness of your humble operation. Google Maps is one of the most popular smartphones apps on both Android and iOS devices, so it’s no wonder that having your business in the Google network is crucial to a successful business. With mobile devices now being used to search from just as much as a desktop or laptop computer, convenience is king, and allowing users to find your business whenever they need to means you’ll be head and shoulders above those that don’t provide similar information online. By updating your Google Map listing and providing current and crucial business information to the public, there’s no doubt you can build awareness of your brand and ultimately bring your business into the 21st century. This entry was posted in SEO on February 5, 2017 by Pinnacle.